The Texas Department of Transportation is planning to fund environmental and financial feasibility studies for a passenger rail line connecting Houston to Austin, according to the Texas Tribune and KUT Austin. 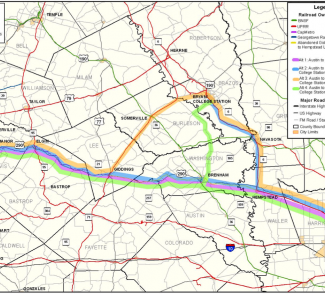 The planned line would be a 110mph train connecting Houston, Hempstead, Brenham, Giddings, and Austin, for about $1.2 billion, although TXDOT is considering several variations, according to a presentation at the Houston – Galveston Area Council Transportation Policy Council as reported by Houston Tomorrow. TXDOT does not have a funding source identified for the completion of the project, but is conducting the studies to be better prepared for future federal funding opportunities, according to KUT Austin. Meanwhile, the Lone Star Rail District is conducting studies on how to move freight traffic from its intended passenger rail line connecting San Antonio to Austin and many points in between, while efforts continue to build a true high speed rail line between Houston and Dallas with all private funding. As I said before, I think any rail line between Houston and Austin that takes longer to drive is highly unlikely to be attractive to people. I still hope there’s more to this than what we’ve seen so far. At first glance, what I’m wondering is how this is supposed to be an improvement over the Trans-Texas Corridor?